In the modern world in which we live we are all in a hurry to get from point “a” to point ”b” and unfortunately investing is the same. Those people that have achieved financial independence have done so by making a number of small decisions over a long period of time. Unfortunately unless you strike oil in your backyard, marry well or win lotto building a solid financial base takes time. Using time to your advantage enables you to take advantage of the power of compounding, which was described by Albert Einstein as “the greatest mathematical discovery of all time” . The principle is fairly simple in that all this involves is investing a lump suminitially that delivers a return and then reinvest those earnings as you receive them. This increases your original investment and so on. To take advantage you need 2 elements patience and time. As an example, let’s assume you have $100,000 in your bank account and decide to put it into an investment with a net 5% annual return. Over the space of the first year, you earn $5,000 on your investment, giving you a total of $105,000. If you leave those earnings alone, rather than pull them out to spend, the second year would deliver another $5,250, or 5% on both the original $100,000 and the $5,000 gain. Your two-year total: $110,250 and climbing. At time passes, the effect of compounding becomes more pronounced as more earnings are generated and that 5% return is applied to a larger balance. In fact after 20 years in our example, the investment would have grown nearly three-fold to more than $265,000. Let’s assume that the investment generates a gross annual return of 8%, is invested personally, and that both Jolene and Christine are on the 38.5% marginal tax rate (including Medicare levy). Intuitively, one would expect that making an annual investment of $10,000 over 20 years and 20,000 over ten years, at the same net rate of return, would produce a similar outcome as the total investment being made is $200,000. 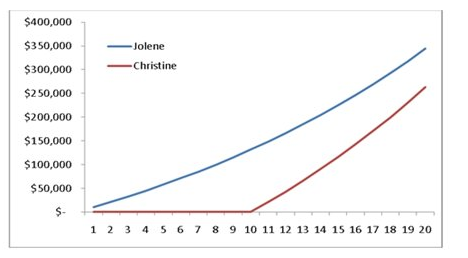 In fact, at the end of 20 years, Jolene’s investment would have grown to around $344,000, while Christine’s would be $262,950; this is $81,050 or 31% higher! In the above example, Christine and Jolene invested the amount they contributed annually in their personal names. What would be the outcome if the annual amount was contributed into superannuation? The effect would be to enhance the effect of compounding due to the lower rate of tax applied to earnings within superannuation compared to marginal rates of tax applied to investing personally. 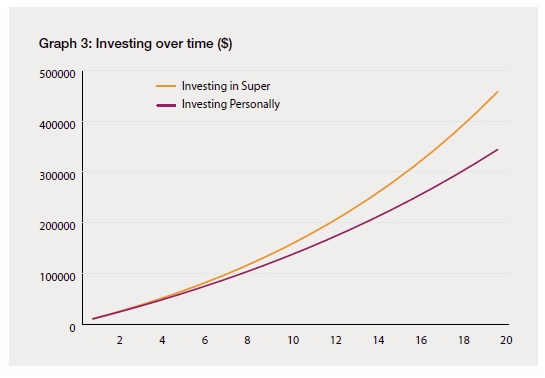 Earnings in superannuation are generally subject to a maximum tax rate of 15%, while earnings generated by investing personally can be taxed at up to 46.5% (including Medicare levy). Jolene’s investment value, by investing annually in superannuation rather than personally, has increased from $344,000 to $457,800; an increase of $113,800 or 33%. This increase is not as a result of Jolene taking on more investment risk, but simply due to the reduction in the tax applicable to the returns her investment is generating together with the compounding effect of this benefit. Diverting the amount she invests into superannuation rather than investing personally. The key point here is that it is generally better to invest smaller amounts now and gradually build up that investment over time as an individual’s capacity to invest increases. In addition, increasing the tax-effectiveness of returns generated can also have a significant impact. Whilst all this sounds great in theory the reality is that most people don’t have the patience to do this and look for short term solutions which inevitably fall short of what they expected. Your life is a reflection of the decisions you make, you make the right decisions and you will over time achieve your objectives. Achieving financial independence is no different, rarely is financial failure the result of one decision but rather the culmination of a series of poor decisions over time. The power of compounding is one of life’s great free kicks and it is worth taking advantage of . 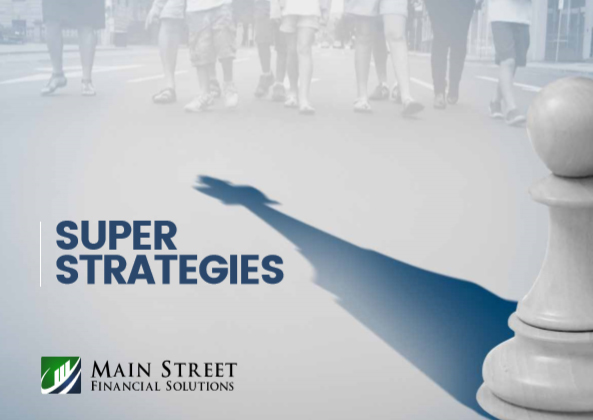 If you have any questions please don’t hesitate to contact us at Main Street Financial Solutions we would love to help you. In uncertain or difficult periods in our lives we naturally rely on friends and family for advice, reassurance and guidance. Whilst this is understandable, when dealing with your financial circumstances this can be problematic, as we are all different and what is suitable for one person may not be suitable for another. In addition to this, as with any decision we make in our lives, emotion plays an important part. 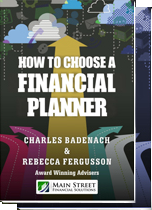 Most decisions in life that we make such as buying a house, changing jobs or getting married, are helped by this support structure, however when we are talking about your financial future this can cause the opposite result of what is intended. By relying on friends and family, the advice you receive is likely to be the result of their personal experiences, which can either be a good or a bad thing. For example, when I was growing up my grandfather’s wealth accumulation strategy was to invest in term deposits, as he was a product of the Great Depression in the early 1930s. Whereas my parents were very much focused on residential property, as that was the best performing asset class in their formative years. Whether or not either of these strategies is the most suitable in the current climate is a difficult question. However what we can say with some certainty is that what was a great investment in the past won’t necessarily be a great investment in the future. The world changes and we need to change with it. The other downside of listening to friends and family for advice is that emotion plays a big part. We all experience “fear” and “greed” at various times in the investment cycle. These emotions can impact on our ability to make sensible financial decisions. As an example, many investors fall into the trap of chasing past performance. By acting on emotion investors inevitably sell their investments at low points in the market cycle and then buy again when markets have already moved upwards. Investing based on past economic conditions is bound to fail, as markets are always changing. Various studies over the years have shown that this approach is one of the great destroyers of personal wealth, yet investors tend to repeat this mistake time and again during market downturns. Having a long-term investment strategy that reflects both your short-term needs and long-term goals will help overcome these natural human emotions. Part of this investment strategy involves establishing an asset allocation that you are comfortable with. This is a very personal decision and the asset allocation your friends or family have could be very different to your own.